If you’re a keen slot player then you definitely do not want to miss out on Mecca Bingo’s latest promotion, Slots Stars. Celebrating the arrival of a brand new batch of slot games, Mecca is treating each and every player to 20% bonus back on net losses after an unsuccessful round of spins. These new slots are diverse enough to appeal to every type of players’ taste and all come with high-quality graphics, excellent extra features and impressive cash prizes. Keep on reading to find out more about Mecca’s new arrivals and earn your 20% bonus. When you play along with the Slots Stars offer, you will receive a 20% bonus back when luck doesn‘t go your way in any of the eligible games. The maximum bonus amount on offer is £50 and the minimum you could win is £2. Remember, this is just what you’ll win if you’re unlucky in your slot of choice. Each game has incredibly high jackpot rewards waiting to be won, so why not try your luck today? If you like the idea of being a guaranteed winner at one of several slot games, make sure you sign into Mecca Bingo between the 2nd and 8th of January. Head over to the ‘My Account’ section of the site and enter the promo code SLOTSTARS in the bonus box. Once you’ve entered the code, all that’s left to do is check out the new slots, start spinning the reels and wait to receive your cash winnings or £50 max bonus back. All of the games featured in Mecca’s latest promotion have graphics, bonuses and game-play that will impress even the most discerning slot spinner. They are all recent realeases from one of the biggest names in the online casino industry, NextGen. Here is what each of the slots has to offer. We could all use a touch of magic when spinning the reels of our favourite slot games. That’s why we can think of no better mascot to preside over the reels than Merlin himself. 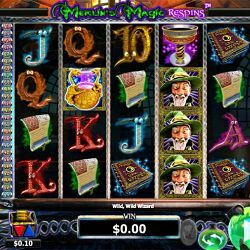 The legendary wizard will treat you to free spins, scatters and wizarding wilds as you play and if you’re lucky enough to win a matching combination of symbols such as spell books, goblets and scrolls- you will come away with some truly enchanting cash rewards. Avid slot fans will be well aware of Foxin’. This crafty cartoon character has already featured on a number of popular NextGen games and now he’s back again, with his pups in tow, to help you win even more wads of cash. This time, you’ll be spinning five reels and 50 pay lines set before a backdrop of a luxury cruise liner and a scenic sea view. As well as massive cash prizes in the base game, Foxin’ Wins Again features brilliant bonuses such as Wilds and Free Spins. Merlin is back again to sprinkle some of his mythical magic over Merlin’s Millions. Dive into the wizard’s wonderful world of enchanting imagery and play the 50 pay lines in the base game where you could come away with as much as 300X your bet. Then there are two exciting bonus features which dish out free spins and much more. Doubleplay Super Bet is sure to impress sticklers for classic casino style slots. This game might look traditional, but don’t be fooled, there are enough extra features packed in to put it in the big leagues alongside NextGen’s other new releases. Here you’ll find a fixed amount of 25 pay lines, straightforward gameplay and a whole host of bonus features. 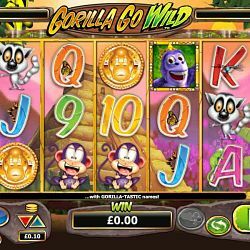 Down in the jungle where nobody goes... you’ll find the Gorilla Go Wild slot. Spend some time monkeying around on these colourful, vibrant reels and you’re sure to come away with some incredibly high cash prizes. The real stand-out features of Gorilla Go Wild are the two randomly triggered bonuses. These extras dish out multipliers, sticky wilds and free spins. Spin Sorceress is a 243-ways-to-win NextGen number which revolves around a mysterious and stunning enchantress. Aside from the amazing artwork in this icy mountaintop slot, it’s the SuperBet feature which makes it so popular with so many players. Other brilliant bonuses allow players to turn entire reels wild and win up to 10 totally free spins. The old saying goes that the best things happen when Irish eyes are smiling. We hope that’s the case for you when you spin the reels of Irish Eyes 2. 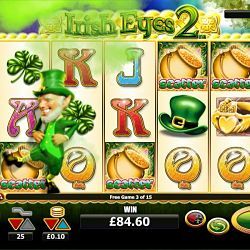 This game is the hotly anticipated follow-up to the hugely popular Irish Eyes slot. We’re happy to see that NextGen have kept all the aspects that made the original slot so popular with fans and made it even better by adding some exciting extra features. You’ll be transported to the beauty of the emerald isle as you play the five reels and 25 pay lines of this slot. Win some seriously impressive prizes along the way, including a jackpot worth 5,000X your original line bet. The Slots Stars is promotion is open to all registered members of Mecca Bingo who are based in England, Scotland or Wales and have made at least one deposit (of any size) during their time at the site. Slots Stars runs from the 2nd until the 8th of January 2017 and only gameplay in the selected slots during this promotional period will qualify for the 20% bonus back. Please note that all winnings from the Slots Stars bonus funds will be subject to a 20X wagering requirement. This must be played through before any winnings can be withdrawn. Bonus funds will appear in players’ accounts immediately after opting into the promotion. The funds will remain valid for seven days, if they remain unused after this time, the bonus will be revoked.